MIND THE GAP: What’s all the chat about abdominal separation? Diastasis recti is the technical term given to the horizontal stretching, or separation that occurs between the rectus abdominis (six pack) muscles during pregnancy: if you think about simple biomechanics, this is why the abdominal muscles are designed with a gap between them, so that our bodies can give the uterus room to grow! This separation can heal itself within about eight weeks, but for a large proportion of new mothers, their core needs a little helping hand in order to heal properly. The problem is, our society – and our media – seems obsessed the ‘yummy mummy’ phenomenon (just look at the commotion Cheryl Cole caused when she stepped out in a crop top five months after giving birth), and the overriding message seems to be that if we’re not back in our size eight skinny jeans or parading around in a bikini a few months after giving birth, then somehow we have failed. The flipside of this though is that not enough attention is being given to the incredible physiological and hormonal changes that our bodies go through during pregnancy and childbirth, including diastasis recti. If a large or significant diastasis is ignored, or left untreated and we rush back into running or jump straight into high intensity bootcamp fitness classes in order to try and live up to this ‘yummy mummy’ image, we can end up causing ourselves considerable long term damage, including lower back pain, umbilical hernias and in some cases it can contribute towards significant pelvic floor dysfunction – such as pelvic organ prolapse. Now we are NOT trying to scare you, as it is inevitable that you will experience some degree of abdominal separation during your pregnancy, but it IS about time we started talking honestly about the changes that happen to our bodies during pregnancy and childbirth, and finally start appreciating the possible consequences. We want to give you the honest facts, so that you can make sensible, and empowered decisions about your lifestyle and exercise. - And finally, *drumroll*… you are doing the wrong type of exercise during and after pregnancy or putting the core under unnecessary pressure through bad postural habits. Sit ups, planks and oblique exercises are not the answer – and in fact these can actually contribute to a larger diastasis. As your pregnancy develops, the first sign of diastasis you might see is a doming down the midline of your tummy, usually around your belly button. Times to look out for this as when you are getting in and out of bed, or in and out of the bath. This usually appears in the second or third trimesters, but if this is your second (or third or fourth!) pregnancy, or you are expecting twins for example, this may occur sooner. - Avoid bad habits: don’t ‘jack knife’ out of bed. Instead, roll roll onto your side and push up with your arms, avoiding a sit up motion. Also try to avoid slouching when you’re sitting down: try and sit tall, putting your weight into your sitting bones, being sure to ‘stack’ your ribs over your hips and actively lengthen your waist by imagining you are being pulled upward by a piece of string at the top of your head. Be careful to bend your knees and keep your back neutral (and not rounded) when lifting heavy loads too. o Deep Abdominal Activation: Lie down on a mat, with knees bent and feet flat on the floor. Take a relaxed breath in, allowing your tummy to gently relax outwards and imagining your sitting bones to moving apart from one another. Then as you breathe out gently draw your pelvic floor up inside you, and your belly button down towards your spine. This is a very small and gentle movement. Repeat 8-10 times. o Pelvic Tilts (against a wall): Stand up against a wall, with your feet a comfortable distance away from the wall (up to 30cm). You will feel a smallish gap between your lower back and the wall itself. 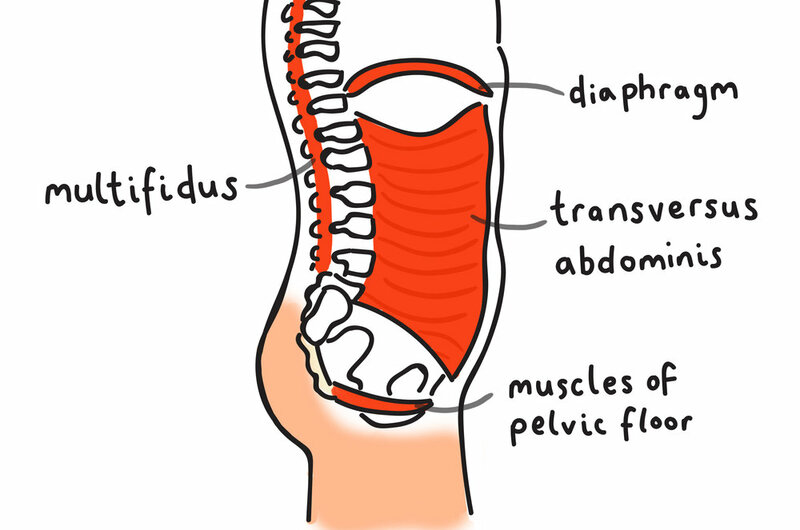 Using the breathing technique described above, as you breathe out tilt your pelvis so you flatten your lower back against the wall. Hold the position here for the length of your exhale breath, and as you inhale, relax and allow the lower back to move away from the wall again. Repeat 8-10 times. - Tape it up: If your diastasis is very noticeable, or you are really suffering with back pain, you may like to tape your tummy using physio tape or wear a support belt. PLEASE NOTE that you are advised to seek the help of a well-qualified personal trainer or physiotherapist to help you with this though, as the wrong type of taping, or too tight a support belt can cause problems too. As we’ve tried to really emphasise, diastasis recti is one of the body’s natural adaptations to pregnancy, and as a result, it can greatly improve on its own within eight weeks of giving birth with the help of good nutrition, good alignment and plenty of rest. However, very often a few rehabilitative exercises are needed to give it a helping hand. To encourage this self-healing, we highly recommend really seeing the first eight weeks (at least!) as time for resting, enjoying and getting to know your precious new baby, and not worrying about, or trying to strengthen your core. Your abdominals will feel very weak and out of place during this time so please try not to worry! - Try and make sure you’re enjoying a nutrient-dense diet (think high protein, complex carbs only, no refined sugar, high in good quality fats) and plenty of water to assist the healing process. - Avoid any heavy or awkward lifting. - Only gradually increase your activity levels (gentle pelvic floor exercises – including the Deep Abdominal Activation and Pelvic Tilts described above – and walking only). - Continue to avoid any bad postural habits, so still no jack-knifing out of bed or slouching when you’re sitting down, but now also think about your posture when breastfeeding, walking with the buggy and carrying your baby. A sway back posture, which very common when you are new mother will only contribute to, or worsen a diastasis. This is still a crucial time for your diastasis healing. You should be offered a six week check up with your GP, but sadly this can often be a very brief affair and rarely do they offer a detailed examination of your abdominals or pelvic floor. Therefore, we advise you to still view this as ‘recovery’ time, even if everything feels (or looks) OK.
- Continue to avoid ‘regular’ exercises – even if you get the all clear to exercise from the GP at your six week check up, PLEASE DON’T rush back into traditional ab exercises, oblique strengtheners, or any loaded rotation and PLEASE avoid getting back into running or any other high impact exercise just yet. It is still very early days in your recovery (even if your diastasis is looking like it will heal itself), so erring on the side of caution is highly recommended. o Leg raises: lie on a mat with knees bent and feet flat on the floor. Take a relaxed breath in, allowing your tummy to gently relax outwards and imagining your sitting bones to moving apart from one another. Then as you breathe out – without moving your back – lift one bent leg up so you have a 90-degree angle at your hip. Return it to the floor before you need to inhale, and then repeat on the other side. Repeat 6-8 times on each side. o Head lift/mini crunch: lie comfortably with your head on a pillow, knees bent and feet flat on the floor. Use the breathwork described above, and as you breathe out, gently lift your head and shoulders off the pillow. Keep an eye on your tummy and make sure there is no doming. Repeat 8-10 times. - Continue to enjoy a nutrient-dense diet (think high protein, complex carbs only, no refined sugar, high in good quality fats) and plenty of water. If you are still experiencing a ‘doming’ in your tummy three months after giving birth, or you can still feel a noticeable gap that you can push quite far down into, now is the time that we would suggest you seek help from a women’s health physiotherapist….as it may be that you need a more detailed, and personalised rehabilitation plan, especially if you are keen to get back to exercise. Your GP can refer you, but there are some amazing private options available…. If you are in London, be sure to look up Clare at Six Physio in London when she goes back to work after her own maternity leave in January! But if you’re in need of help before then, give Six Physio a call anyway to find your nearest branch (https://www.sixphysio.com/). Six Physio offer physiotherapy assessment both antenatally and postnatally: for pregnant clients this would include assessment and treatment pelvic girdle pain, back pain and incontinence. Once you’ve had your baby they offer a Postnatal Body Check for women after 6 weeks to complete a full assessment of your pelvis, back and posture, abdominal assessment, including the use of real time ultrasound and a full pelvic floor examination. The advice is then specifically tailored to you, your needs and goals. If you’re not based in London, and want help finding a private women’s health physiotherapist near you, please check out http://themummymot.com who offer a great search engine for finding your nearest clinic or practitioner.